the development of acute or chronic graft-versushost disease. Figure 2 Map of genetic loci that can influence histocompatibility in the allogeneic hematopoietic cell transplantation (HCT) setting. 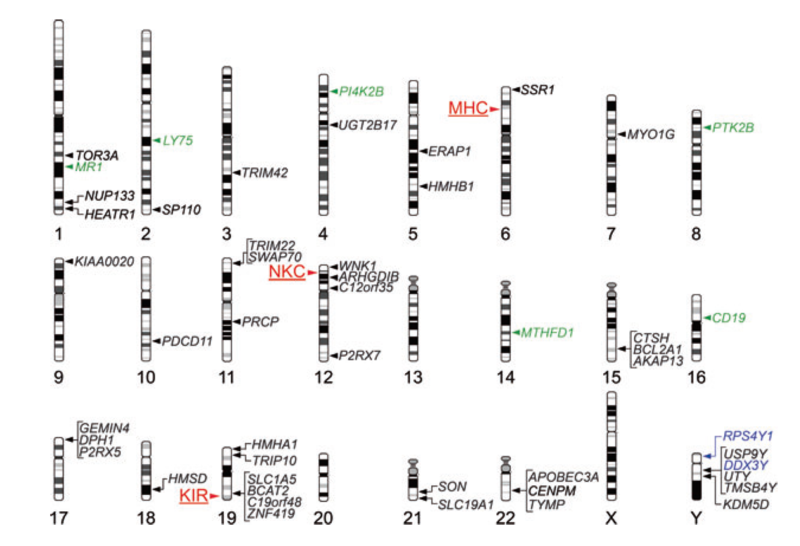 The chromosomal location of the major histocompatibility complex (MHC), and of two other multigene clusters, the natural killer complex (NKC) and the KIR locus, are indicated by red labels and arrowheads to the left of the corresponding chromosomes. The chromosomal locations of genes that have been shown to encode T lymphocyte-defined minor histocompatibility antigens are indicated by labels and arrowheads to the right of the corresponding chromosomes; genes that encode class I MHC-restricted minor H antigens recognized by CD8+ T cells are indicated by black labels, those that encode class II MHC-restricted minor H antigens recognized by CD4+ T cells are indicated by green labels, and those that encode both class I- and class II MHC-restricted minor H antigens are indicated by blue labels. Figure 3 Basic organization and gene content of the human KIR locus on chromosome 19q. Two hypothetical haplotypes are illustrated: an A (top) and a B (bottom) haplotype. Framework genes (which can be coding genes or pseudogenes) are illustrated in blue; nonframework activating genes are in green, inhibitory genes in red, and pseudogenes in purple. Adapted from http://www.ebi.ac.uk/ipd/kir/sequenced_haplotypes.html. effect to achieve a comparable rate of posttransplant relapse. FLU, fludarabine; AraC, cytarabine; ATG, anti-thymocyte globulin. Weiden PL, Flournoy N, Thomas ED et al. Antileukemic effect of graft-versus-host disease in human recipients of allogeneic-marrow grafts. N Engl J Med 1979: 300: 1068–73. Weiden PL, Sullivan KM, Flournoy N, Storb R, Thomas ED. Antileukemic effect of chronic graft-versus-host disease: contribution to improved survival after allogeneic marrow transplantation. N Engl J Med 1981: 304: 1529–33. Horowitz MM, Gale RP, Sondel PM et al.Graft-versus-leukemia reactions after bone marrow transplantation. Blood 1990: 75: 555–62. Gratwohl A, Brand R, Apperley J et al. Graft-versus-host disease and outcome in HLA-identical sibling transplantations for chronic myeloid leukemia. Blood 2002: 100: 3877–86. Stern M, de Wreede LC, Brand R et al. Impact of graft-versus-host disease on relapse after allogeneic hematopoietic stem cell transplantation, an EBMT megafile study. ASH Annual Meeting Abstracts 2012: 120: 469. Ruggeri L, Capanni M, Urbani E et al. Effectiveness of donor natural killer cell alloreactivity in mismatched hematopoietic transplants. Science 2002: 295: 2097–100. Vago L, Perna SK, Zanussi M et al. Loss of mismatched HLA in leukemia after stem-cell transplantation. N Engl J Med 2009: 361: 478–88. Villalobos IB, Takahashi Y, Akatsuka Y et al. Relapse of leukemia with loss of mismatched HLA resulting from uniparental disomy after haploidentical hematopoietic stem cell transplantation. Blood 2010: 115: 3158–61. 10. Wagner JE, Thompson JS, Carter SL, Kernan NA. Effect of graft-versus-host disease prophylaxis on 3-year disease-free survival in recipients of unrelated donor bone marrow (T-cell Depletion Trial): a multi-centre, randomised phase II-III trial. Lancet 2005: 366: 733–41. Zorn E, Wang KS, Hochberg EP et al. Infusion of CD4+ donor lymphocytes induces the expansion of CD8+ donor T cells with cytolytic activity directed against recipient hematopoietic cells. Clin Cancer Res 2002: 8: 2052–60. Kircher B, Stevanovic S, Urbanek M et al. Induction of HA-1-specific cytotoxic T-cell clones parallels the therapeutic effect of donor lymphocyte infusion. Br J Haematol 2002: 117: 935–9. Marijt WA, Heemskerk MH, Kloosterboer FM et al. Hematopoiesis-restricted minor histocompatibility antigens HA-1- or HA-2-specific T cells can induce complete remissions of relapsed leukemia. Proc Natl Acad Sci U S A 2003: 100: 2742–7. Giralt S, Hester J, Huh Y et al. CD8-depleted donor lymphocyte infusion as treatment for relapsed chronic myelogenous leukemia after allogeneic bone marrow transplantation. Blood 1995: 86: 4337–43. Alyea EP, Soiffer RJ, Canning C et al. Toxicity and efficacy of defined doses of CD4(+) donor lymphocytes for treatment of relapse after allogeneic bone marrow transplant. Blood 1998: 91: 3671–80. Takami A, Sugimori C, Feng X et al. Expansion and activation of minor histocompatibility antigen HY-specific T cells associated with graft-versus-leukemia response. Bone Marrow Transplant 2004: 34: 703–9. den Haan JM, Meadows LM, Wang W et al. The minor histocompatibility antigen HA-1: a diallelic gene with a single amino acid polymorphism. Science 1998: 279: 1054–7. Brickner AG, Warren EH, Caldwell JA et al. The immunogenicity of a new human minor histocompatibility antigen results from differential antigen processing. J Exp Med 2001: 193: 195–206. 1000 Genomes Project Consortium. A map of human genome variation from population-scale sequencing. Nature 2010: 467: 1061–73. Warren EH, Zhang XC, Li S et al. Effect of MHC and non-MHC donor/recipient genetic disparity on the outcome of allogeneic HCT. Blood 2012: 120: 2796–806. Murata M, Warren EH, Riddell SR. A human minor histocompatibility antigen resulting from differential expression due to a gene deletion. J Exp Med 2003: 197: 1279–89. Molldrem JJ, Lee PP, Wang C et al. Evidence that specific T lymphocytes may participate in the elimination of chronic myelogenous leukemia. Nat Med 2000: 6: 1018–23. Rezvani K, Yong AS, Savani BN et al. Graft-versus-leukemia effects associated with detectable Wilms tumor-1 specific T lymphocytes following allogeneic stem cell transplantation for acute lymphoblastic leukemia (ALL). Blood 2007: 110: 1924–32. Atanackovic D, Arfsten J, Cao Y et al. Cancer-testis antigens are commonly expressed in multiple myeloma and induce systemic immunity following allogeneic stem cell transplantation. Blood 2007: 109: 1103–12. McLarnon A, Piper KP, Goodyear OC et al. CD8(+) T-cell immunity against cancer-testis antigens develops following allogeneic stem cell transplantation and reveals a potential mechanism for the graft-versus-leukemia effect. Haematologica 2010: 95: 1572–8. Takahashi Y, Harashima N, Kajigaya S et al. Regression of human kidney cancer following allogeneic stem cell transplantation is associated with recognition of an HERV-E antigen by T cells. J Clin Invest 2008: 118: 1099–109. Verheyden S, Schots R, Duquet W, Demanet C. A defined donor activating natural killer cell receptor genotype protects against leukemic relapse after related HLA-identical hematopoietic stem cell transplantation. Leukemia 2005: 19: 1446–51. Hsu KC, Keever-Taylor CA, Wilton A et al. Improved outcome in HLA-identical sibling hematopoietic stem-cell transplantation for acute myelogenous leukemia predicted by KIR and HLA genotypes. Blood 2005: 105: 4878–84. Stringaris K, Adams S, Uribe M et al. Donor KIR Genes 2DL5A, 2DS1 and 3DS1 are associated with a reduced rate of leukemia relapse after HLA-identical sibling stem cell transplantation for acute myeloid leukemia but not other hematologic malignancies. Biol Blood Marrow Transplant 2010: 16: 1257–64. Hsu KC, Gooley T, Malkki M et al. KIR ligands and prediction of relapse after unrelated donor hematopoietic cell transplantation for hematologic malignancy. Biol Blood Marrow Transplant 2006: 12: 828–36. Miller JS, Cooley S, Parham P et al. Missing KIR ligands are associated with less relapse and increased graft-versus-host disease (GVHD) following unrelated donor allogeneic HCT. Blood 2007: 109: 5058–61. Cooley S, Trachtenberg E, Bergemann TL et al. Donors with group B KIR haplotypes improve relapse-free survival after unrelated hematopoietic cell transplantation for acute myelogenous leukemia. Blood 2009: 113: 726–32. Cooley S, Weisdorf DJ, Guethlein LA et al. Donor selection for natural killer cell receptor genes leads to superior survival after unrelated transplantation for acute myelogenous leukemia. Blood 2010: 116: 2411–9. Venstrom JM, Pittari G, Gooley TA et al. HLA-C-dependent prevention of leukemia relapse by donor activating KIR2DS1. N Engl J Med 2012: 367: 805–16. Peruzzi M, Wagtmann N, Long EO. A p70 killer cell inhibitory receptor specific for several HLA-B allotypes discriminates among peptides bound to HLA-B*2705. J Exp Med 1996: 184: 1585–90. Rajagopalan S, Long EO. The direct binding of a p58 killer cell inhibitory receptor to human histocompatibility leukocyte antigen (HLA)-Cw4 exhibits peptide selectivity. J Exp Med 1997: 185: 1523–8. Boyington JC, Motyka SA, Schuck P, Brooks AG, Sun PD. Crystal structure of an NK cell immunoglobulin-like receptor in complex with its class I MHC ligand. Nature 2000: 405: 537–43. Fan QR, Long EO, Wiley DC. Crystal structure of the human natural killer cell inhibitory receptor KIR2DL1-HLA-Cw4 complex. 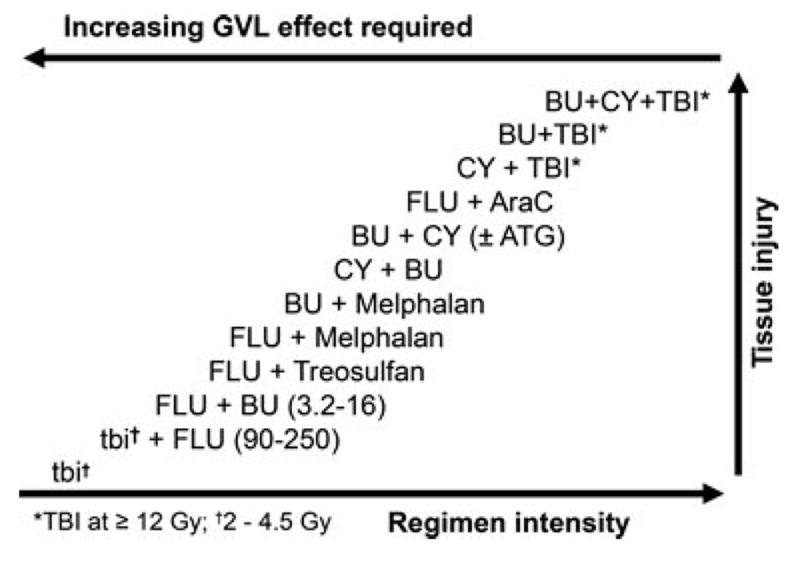 Nat Immunol 2001: 2: 452–60. Baron F, Petersdorf EW, Gooley T et al. What is the role for donor natural killer cells after nonmyeloablative conditioning― Biol Blood Marrow Transplant 2009: 15: 580–8. Wu CJ, Yang XF, McLaughlin S et al. Detection of a potent humoral response associated with immune-induced remission of chronic myelogenous leukemia. J Clin Invest 2000: 106: 705–14. Bellucci R, Alyea EP, Chiaretti S et al. Graft-versus-tumor response in patients with multiple myeloma is associated with antibody response to BCMA, a plasma-cell membrane receptor. Blood 2005: 105: 3945–50. Bray RA, Hurley CK, Kamani NR et al. National marrow donor program HLA matching guidelines for unrelated adult donor hematopoietic cell transplants. Biol Blood Marrow Transplant 2008: 14: 45–53. Kawase T, Morishima Y, Matsuo K et al. High-risk HLA allele mismatch combinations responsible for severe acute graft-versus-host disease and implication for its molecular mechanism. Blood 2007: 110: 2235–41. Shaw BE, Gooley TA, Malkki M et al. The importance of HLA-DPB1 in unrelated donor hematopoietic cell transplantation. Blood 2007: 110: 4560–6. Fleischhauer K, Shaw BE, Gooley T et al. Effect of T-cell-epitope matching at HLA-DPB1 in recipients of unrelated-donor haemopoietic-cell transplantation: a retrospective study. Lancet Oncol 2012: 13: 366–74. Kawase T, Matsuo K, Kashiwase K et al. HLA mismatch combinations associated with decreased risk of relapse: implications for the molecular mechanism. Blood 2009: 113: 2851–8. Shaw BE, Mayor NP, Russell NH et al. Diverging effects of HLA-DPB1 matching status on outcome following unrelated donor transplantation depending on disease stage and the degree of matching for other HLA alleles. Leukemia 2010: 24: 58–65. Anasetti C, Logan BR, Lee SJ et al. Peripheral-blood stem cells versus bone marrow from unrelated donors. N Engl J Med 2012: 367: 1487–96. Deeg HJ, Spitzer TR, Cottler-Fox M, Cahill R, Pickle LW. Conditioning-related toxicity and acute graft-versus-host disease in patients given methotrexate/cyclosporine prophylaxis. Bone Marrow Transplant 1991: 7: 193–8. Clift RA, Buckner CD, Appelbaum FR et al. Allogeneic marrow transplantation in patients with chronic myeloid leukemia in the chronic phase: a randomized trial of two irradiation regimens. Blood 1991: 77: 1660–5. Mielcarek M, Martin PJ, Leisenring W et al. 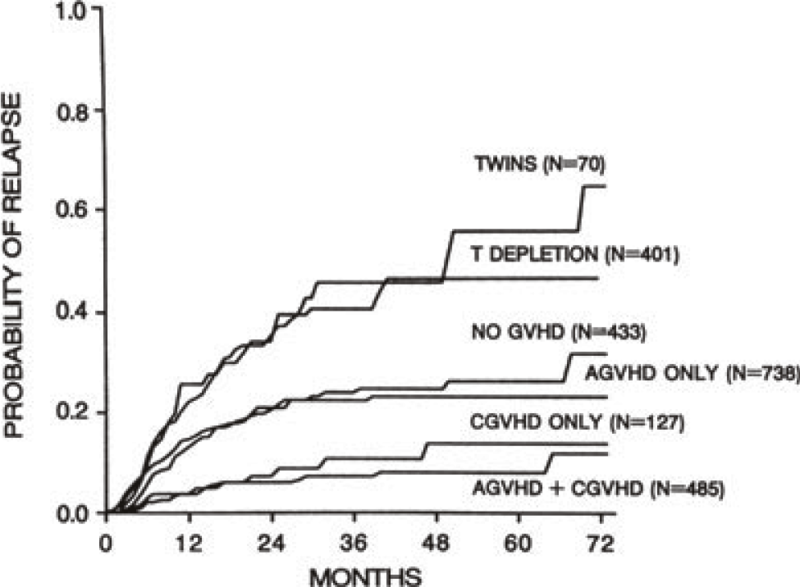 Graft-versus-host disease after nonmyeloablative versus conventional hematopoietic stem cell transplantation. Blood 2003: 102: 756–62. Rotta M, Storer BE, Storb R et al. Impact of recipient statin treatment on graft-versus-host disease after allogeneic hematopoietic cell transplantation. Biol Blood Marrow Transplant 2010: 16: 1463–6. Rotta M, Storer BE, Storb RF et al. Donor statin treatment protects against severe acute graft-versus-host disease after related allogeneic hematopoietic cell transplantation. Blood 2010: 115: 1288–95. Deeg HJ, Storer BE, Boeckh M et al. Reduced incidence of acute and chronic graft-versus-host disease with the addition of thymoglobulin to a targeted busulfan/cyclophosphamide regimen. Biol Blood Marrow Transplant 2006: 12: 573–84. Soiffer RJ, Lerademacher J, Ho V et al. Impact of immune modulation with anti-T-cell antibodies on the outcome of reduced-intensity allogeneic hematopoietic stem cell transplantation for hematologic malignancies. Blood 2011: 117: 6963–70. Bashey A, Medina B, Corringham S et al. CTLA4 blockade with ipilimumab to treat relapse of malignancy after allogeneic hematopoietic cell transplantation. Blood 2009: 113: 1581–8. Zhou J, Bashey A, Zhong R et al. CTLA-4 blockade following relapse of malignancy after allogeneic stem cell transplantation is associated with T cell activation but not with increased levels of T regulatory cells. Biol Blood Marrow Transplant 2011: 17: 682–92. Topalian SL, Hodi FS, Brahmer JR et al. Safety, activity, and immune correlates of anti-PD-1 antibody in cancer. N Engl J Med 2012: 366: 2443–54. Brahmer JR, Tykodi SS, Chow LQ et al. Safety and activity of anti-PD-L1 antibody in patients with advanced cancer. N Engl J Med 2012: 366: 2455–65. Maury S, Lemoine FM, Hicheri Y et al. CD4 + CD25+ regulatory T cell depletion improves the graft-versus-tumor effect of donor lymphocytes after allogeneic hematopoietic stem cell transplantation. Sci Transl Med 2010: 2: 41–52. Kwak LW, Taub DD, Duffey PL et al. Transfer of myeloma idiotype-specific immunity from an actively immunised marrow donor. Lancet 1995: 345: 1016–20. Cabrera R, Diaz-Espada F, Barrios Y et al. Infusion of lymphocytes obtained from a donor immunised with the paraprotein idiotype as a treatment in a relapsed myeloma. Bone Marrow Transplant 2000: 25: 1105–8. Neelapu SS, Munshi NC, Jagannath S et al. Tumor antigen immunization of sibling stem cell transplant donors in multiple myeloma. Bone Marrow Transplant 2005: 36: 315–23. Sergeeva A, Alatrash G, He H et al. An anti-PR1/HLA-A2 T-cell receptor-like antibody mediates complement-dependent cytotoxicity against acute myeloid leukemia progenitor cells. Blood 2011: 117: 4262–72. Rousseau RF, Biagi E, Dutour A et al. Immunotherapy of high-risk acute leukemia with a recipient (autologous) vaccine expressing transgenic human CD40L and IL-2 after chemotherapy and allogeneic stem cell transplantation. Blood 2006: 107: 1332–41. Ho VT, Vanneman M, Kim H et al. Biologic activity of irradiated, autologous, GM-CSF-secreting leukemia cell vaccines early after allogeneic stem cell transplantation. Proc Natl Acad Sci U S A 2009: 106: 15825–30. Riddell SR, Watanabe KS, Goodrich JM, Li CR, Agha ME, Greenberg PD. Restoration of viral immunity in immunodeficient humans by the adoptive transfer of T cell clones. Science 1992: 257: 238–41. Rooney CM, Smith CA, Ng CY et al. Use of gene-modified virus-specific T lymphocytes to control Epstein-Barr-virus-related lymphoproliferation. Lancet 1995: 345: 9–13. Leen AM, Myers GD, Sili U et al. Monoculture-derived T lymphocytes specific for multiple viruses expand and produce clinically relevant effects in immunocompromised individuals. Nat Med 2006: 12: 1160–6. Hanley PJ, Cruz CR, Savoldo B et al. Functionally active virus-specific T cells that target CMV, adenovirus, and EBV can be expanded from naive T-cell populations in cord blood and will target a range of viral epitopes. Blood 2009: 114: 1958–67. Heemskerk MH, Hoogeboom M, Hagedoorn R, Kester MG, Willemze R, Falkenburg JH. Reprogramming of virus-specific T cells into leukemia-reactive T cells using T cell receptor gene transfer. J Exp Med 2004: 199: 885–94. Cooper LJ, Al-Kadhimi Z, Serrano LM et al. Enhanced antilymphoma efficacy of CD19-redirected influenza MP1-specific CTLs by cotransfer of T cells modified to present influenza MP1. Blood 2005: 105: 1622–31. Micklethwaite KP, Savoldo B, Hanley PJ et al. Derivation of human T lymphocytes from cord blood and peripheral blood with antiviral and antileukemic specificity from a single culture as protection against infection and relapse after stem cell transplantation. Blood 2010: 115: 2695–703. Kochenderfer JN, Wilson WH, Janik JE et al. Eradication of B-lineage cells and regression of lymphoma in a patient treated with autologous T cells genetically engineered to recognize CD19. Blood 2010: 116: 4099–102. Savoldo B, Ramos CA, Liu E et al. CD28 costimulation improves expansion and persistence of chimeric antigen receptor-modified T cells in lymphoma patients. J Clin Invest 2011: 121: 1822–6. Porter DL, Levine BL, Kalos M, Bagg A, June CH. Chimeric antigen receptor-modified T cells in chronic lymphoid leukemia. N Engl J Med 2011: 365: 725–33. Brentjens RJ, Riviere I, Park JH et al. Safety and persistence of adoptively transferred autologous CD19-targeted T cells in patients with relapsed or chemotherapy refractory B-cell leukemias. Blood 2011: 118: 4817–28. Kochenderfer JN, Dudley ME, Feldman SA et al. B-cell depletion and remissions of malignancy along with cytokine-associated toxicity in a clinical trial of anti-CD19 chimeric-antigen-receptor-transduced T cells. Blood 2012: 119: 2709–20. Kochenderfer JN, Dudley ME, Maric I et al. Dramatic regression of chronic lymphocytic leukemia in the first patient treated with donor-derived genetically-engineered anti-CD19-chimeric-antigen-receptor-expressing T cells after allogeneic hematopoietic stem cell transplantation. Biol Blood Marrow Transplant 2011: 17: S158. Provasi E, Genovese P, Lombardo A et al. Editing T cell specificity towards leukemia by zinc finger nucleases and lentiviral gene transfer. Nat Med 2012: 18: 807–15. Copyright © HLA LABORATORY Rights Reserved.